Authorities on Sunday blamed flooding that intensified an already chaotic scene at John F. Kennedy International Airport in New York City on an apparent frozen, unprotected water pipe. Rick Cotton, executive director of the Port Authority of New York and New Jersey, which manages the airport, said at a news conference that the pipe fed a sprinkler system in a privately operated terminal. "We will thoroughly investigate why this pipe burst and thoroughly investigate why it was not adequately protected and thoroughly investigate the contingency plan for this event," Cotton said. It was not immediately clear who operates the terminal. The burst pipe caused 3 inches of water to flood the arrivals area of Terminal 4, which services Delta and 30 international airlines, before it cascaded onto the roadway, where it froze, Cotton said. The arrivals and Customs and Border Patrol sections were shut down, and electricity to the entire terminal was shut off to prevent short circuits, he said. Flights were delayed, equipment froze, passengers were stranded and baggage piled up. Cotton said it was "totally unacceptable" that the arrivals area was closed for four hours, adding: "It is not what the Port Authority expects in terms of providing service to its passengers, and it is totally not what the Port Authority expects from its private operators." As of Sunday night, more than 500 flights had been canceled or delayed arriving and departing the airport, according to the flight tracking website FlightAware. Weary travelers faced hours-long waits on the tarmac and additional hours-long waits to retrieve their baggage once they were in the terminal, NBC New York reported. 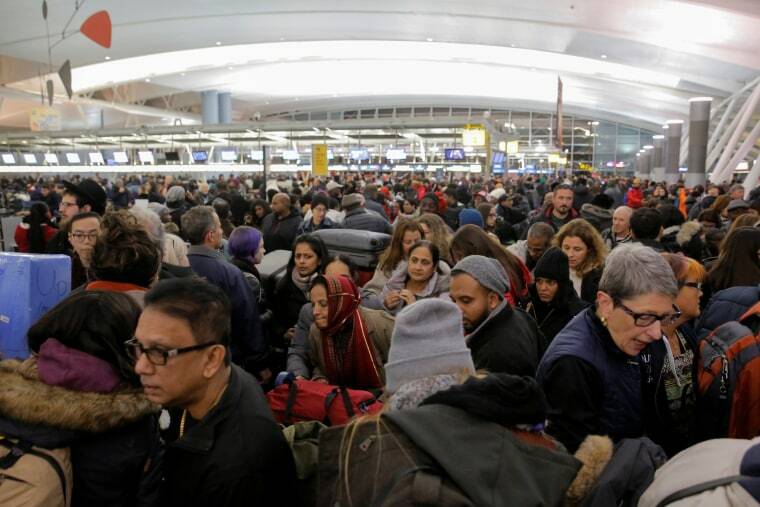 "It's getting like a madhouse," traveler Steven Litvin told NBC New York. "People are getting upset. You have little kids, you have animals. It's a madhouse." Litvin said he and his wife were leaving the airport eight hours after their flight landed — with only half their luggage. "We're tired," he said. "We're frustrated. We didn't get any sleep, and we still don't know where our bags are. Nobody knows anything, and they all give you a circular answer: 'It's coming soon.'" The airline Virgin Atlantic tweeted in the early morning hours Sunday that police were called to a "disturbance" at a gate they were sharing with another airline after a flight was cancelled. @VirginAtlantic what is going on with your flights leaving @JFKairport flights cancelled police called. And earlier Saturday at JFK, the right wing of a China Southern plane hit the tail of a Kuwait Airways plane, the Port Authority said in a statement. No injuries were reported. The Federal Aviation Administration said the planes touched while the China Southern plane was being towed to a taxiway and the Kuwait Airways plane was at the gate awaiting departure. The Port Authority said Sunday that airlines "remain in recovery mode, rebooking passengers from canceled flights and reuniting passengers with their luggage." "Frigid temperatures continue to cause equipment failures and slower than normal operations," the statement said. "Customers may experience residual delays, particularly for international flights."